Still deciding where to travel this summer? Need help narrowing down the options? Don't worry, as that is what we are here for. We know how overwhelming it can be when you're bombarded with emails, tweets and promos on a daily basis, so we regularly scour our luxury travel deal-filled inbox on your behalf. Below are a few favorite offers currently available to those seeking a relaxing upscale getaway in style. Ventana Inn & Spa: Book a two-night stay in Big Sur through a preferred travel agency like Elite Travel International and receive a $100 to $200 resort credit depending on room/suite category. Book by July 18 for travel through December 30. La Casa Que Canta: Enjoy Zihuatanejo at its best at this romantic gem where 3rd night is free through October. Our exclusive rates include breakfast for two, round-trip airport transfers + 20% discount on additional meals. Four Seasons Milan: Shop til you drop then relax & dine in style at this fashionable hotel where you will enjoy 150 Euro food/beverage credit & 20% discount off city-wide limo services through Sept 4. In August, 3rd night's half off. Plus, enjoy our Preferred Partner perks (daily breakfast, a comp lunch and priority upgrade!). 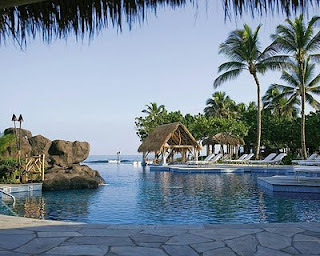 Four Seasons Hualalai: You'll be hard-pressed to find a better family travel offer to Hawaii this summer. Fresh from a facelift, this luxurious Big Island resort (pictured) offers our clients a second room at 50% off Jun 20-July 21 and August 21-Nov 17, as well as Preferred Partner amenities (breakfast and a complimentary lunch). XIV Beacon: Stay "Fit & Fabulous" this summer at this Boston boutique hotel with a wellness package priced from $985/night inclusive of a one-hour private yoga session in-room or on the private roof deck; one-day bike rental; one-hour deep tissue massage; and daily power breakfast. Ritz-Carlton Caribbean: From Cancun to Grand Cayman to St. Thomas to San Juan (and Jamaica too), the Ritz-Carlton resorts of the region offer various 4th and 5th night free package options all summer long. Go all-inclusive from $439/night in Jamaica or Reconnect in St Thomas for $489/night with $100 hotel credit as an extra bonus. Be sure to ask us about our STARs priority perks! Why book through Elite Travel International? We will always get you the absolute best value and VIP recognition from our friends at luxury hotels worldwide, and you'll enjoy exclusive VIP perks & amenities thanks to our privileged partnership with Virtuoso and our preferred agency status with Four Seasons, Ritz-Carlton, Orient Express, Rosewood, Park Hyatt, Starwood, Leading Hotels of the World, Small Luxury Hotels, Preferred Hotels & others around the globe. and I’m glad to see some of my tips in your list! Although many travel agency in the market but some of them good quality of services, but most agency not level of quality, so Elite Travel International provide good quality of travel service in Europe. When you have finally decided to limousine in Long Island to choose, be sure to make a call a few days before your trip or visit to ensure you reserved and can use your selected date. Now a days travel agencies are being too smart over. Visit http://www.akbartravelsonline.com and book 1 ticket to Colombo at Rs 7960* + taxes and get 2nd Ticket at 3980*+Taxes. Its a great limo service. Long Island Limo do it in style, we give best limousine service in NYC. That goes extra mile to make you feel royal, whether you want to impression at a private parties or special occasion. We appreciate you this excellent article. We mainly enjoyed critiquing it all in addition to ought to talk to absolutely everyone. In summers, traveling in limousines would be great. A limousine is the best ride of summers, vacations because limousine is the most comfortable ride I suggest you choose the limousine car and enjoyed your summer vacation with limousine our family or friends. Limousine in long island limo services provides its services through the whole year. I like limousine for travel and i always use limo when i go anywhere. you are wright a excellent article in this blog we appreciate you for this article. it was an amazing experience reading your blog. Keep writing. Although many travel agency in the market but some of them good quality of services, but most agency not level of quality,so JFK Airport Limousine Service Provide a good quality travel in New York. You are prepare a nice blog and this have a nice information about limousine. limo in port Washington NY provide services very reliable and suitable.all kind of services is very use full and well. Nice post i hope in future your share same post. Nice post. Thanks for useful information. Wow! Your great post remind me about sweet summer holidays. I think that we must booking some hotel now to avoid any problems in summer. Thanks for your advices. No doubt you are doing great work here. Please keep it good posting! Good academic papers for sale online 24/7!